18 REASONS - EMPOWERING OUR COMMUNITY WITH THE CONFIDENCE AND CREATIVITY TO BUY, COOK, AND EAT GOOD FOOD EVERY DAY. Each of us is on a food journey. Whether your goal today is to make a quick meal for your family, explore a culinary skill or indulge in a hedonistic exploration of taste, every journey is personal and meaningful. Our teachers are your guides, committed to helping you explore your definition of good food. Lasting changes begin with small steps. Our classes, dinners, and community gatherings provide a welcoming place to practice new skills, ask questions and celebrate. Whether you’re an experienced home cook, a new neighbor looking for a fun night out or someone just learning your way around the kitchen, we welcome you to our table. We live to empower our community. Our passionate and committed teachers share their stories, skills and knowledge. In our classroom on 18th Street you can sharpen your knife skills, share a community dinner with friends, taste home­cooked meals from around the world, and learn from farmers, winemakers, ranchers, crafters and cooks. We go beyond our classroom walls. We offer free Cooking Matters classes in low ­income communities around the Bay Area. In our classes, we cook, eat and discover how to make quick, healthy, affordable, delicious meals every day. 18 Reasons grew out of Bi-Rite Market's desire to create a space where community members could deepen their relationships with food and with each other. In a small space on Guerrero Street, the first tastings and dinners sought to connect neighbors with the farmers and producers who sold their products at Bi-Rite Market. 18 Reasons quickly took on a life of its own, expanding to hands-on classes and monthly Community Dinners, and relocating to our current home on 18th Street. Meanwhile, Sarah Nelson launched the nonprofit Three Squares in 2011 to bring free Cooking Matters cooking and nutrition classes to low-income communities throughout the Bay Area. Sarah worked with Bi­-Rite Market and 18 Reasons to launch San Francisco's first Food & Farm Film Fest in 2013. The two organizations liked collaborating so much that they decided to join forces and merge later that spring. 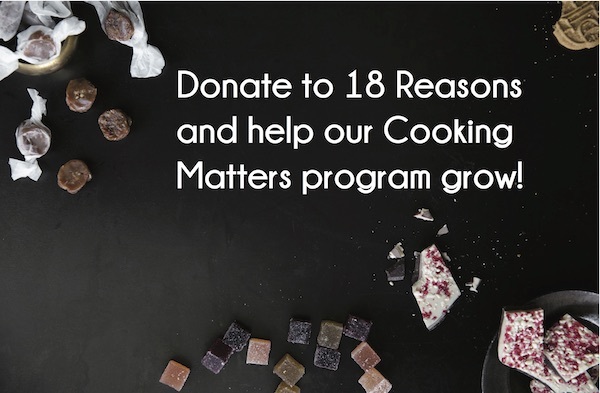 Today, 18 Reasons offers classes and dinners on a nightly basis in our classroom on 18th St, and offers free Cooking Matters classes to over 3,000 low-income Bay Area adults, teens, and kids every year. 18 Reasons is now an independent 501c3 nonprofit organization as well as a proud member of the Bi ­Rite Family. If you’ve been in the Mission for a while, you may remember the large sign atop a building at the corner of 17th Street and Mission. It simply, and mysteriously stated: 17 Reasons. It was tragically taken down in 2002 and replaced by an ordinary billboard.To mark the change in the gallery’s management and pay tribute to this much­missed icon, we decided to rechristen the space as 18 Reasons. Eighteen because our home is 18th Street and because…well, it never hurts to have one more reason. Take a look at this video about the original sign! 20100529 17reasons-desktop from Mission Local on Vimeo.